WASHINGTON — The U.S. Navy is looking for inputs from industry on a new multimission guided-missile frigate adapted from existing ship designs, a major departure from its modular littoral combat ship, according to a request for information released Monday. 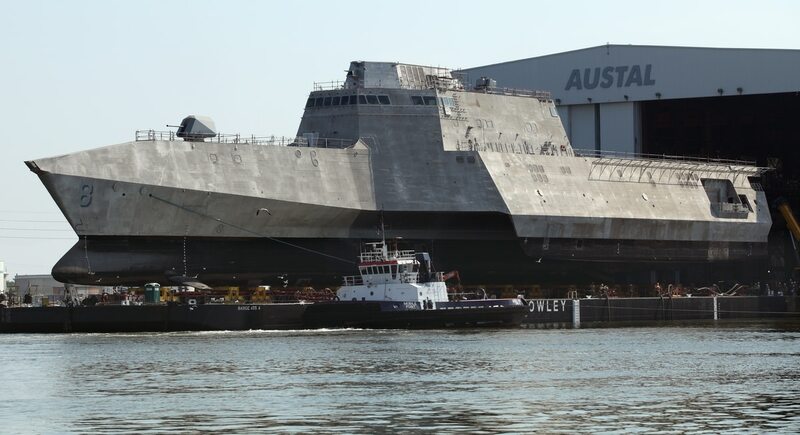 The RFI lays out a ship that opens the door to almost any existing design that can be adapted to the Navy's needs, which extends beyond just the two LCS hull forms being built by Lockheed Martin and Austal USA. The service is looking for a ship with combat and mechanical systems that will fully integrate with a carrier strike group, hunt submarines and kill ships over the horizon. Labeling the ship the FFG(X), the ship will be expected to keep up with the full carrier strike group and be able to operate independently in high-end threat environments. The Navy is looking to avoid "sticker shock," said Rear Adm. Ronald Boxall, the service's director of surface warfare, said in a Monday telephone interview, and engage with ship builders about what trade-offs the Navy would have to make to get the most capability from the ship. An exclusive interview with Rear Adm. Ronald Boxall on the new design. "This is an effort to get the design right up front," Boxall said. "We're looking to have a dialogue with industry to get the most capability for the best price." Boxall did not say how much the U.S. Navy is willing to spend but said the RFI was intended to draw out what the U.S. Navy could get for its shipbuilding dollar. In order to get the ship to the fleet as fast as possible, the U.S. Navy wants builders to adapt from existing designs, the RFI said. "A competition for FFG(X) is envisioned to consider existing parent designs for a Small Surface Combatant that can be modified to accommodate the specific capability requirements prescribed by the US Navy," it reads. The U.S. Navy wants a frigate that can keep up with the aircraft carrier — a nagging problem with the current classes of small surface combatants — and have sensors networked in with the rest of the fleet to expand the overall tactical picture available to the group. "The FFG(X) will normally aggregate into strike groups and Large Surface Combatant led surface action groups but also possess the ability to robustly defend itself during conduct of independent operations while connected and contributing to the fleet tactical grid." The U.S. Navy is looking to limit the number of ground-breaking technologies that go into the ship, looking for engineering and combat systems that are already common in the fleet. Other capabilities in "tier two" include various sonar equipment such as variable-depth and towed-array sonar, Cooperative Engagement Capability to be able to share target data with other ships and aircraft in the fleet, rigid-hull inflatable boats, Next Generation Surface Search Radar, and a MK 110 57mm gun and related systems. The U.S. Navy wants the ship to be used for surface and anti-submarine warfare — traditional frigate roles — and to take on lower-level missions, such as security cooperation, that don't require multibillion-dollar warships. It also must be hardened against electronic warfare attack. The U.S. Navy is also particularly interested in having the frigate be a platform for deploying unmanned systems "to penetrate and dwell in contested environments, operating at greater risk to gain sensor and weapons advantages over the adversary." The frigate should be able to establish a complicated picture of a tactical environment with its on-board sensors, unmanned systems and embarked aircraft and beam that information back to the fleet through secure communications. The U.S. Navy intends to award the contract for the first FFG(X) in 2020. It will buy one in 2020 and one in 2021, followed by two each year after that. The U.S. Navy's requirement is for 52 small-surface combatants, the bulk of which will be LCS. You can read the entire RFI here.